We created this book for you! These recipes have developed over a 23 year history of providing a weekly meal for our community. What to prepare at the next family gathering? The next potluck or dinner party? 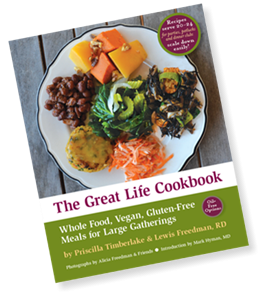 These recipes are easy to follow and are appealing to everyone new and old to this way of eating. We invite you to explore the monthly dinner menus and dare to cook something wholesome and delicious for your friends! (above) The December meal. 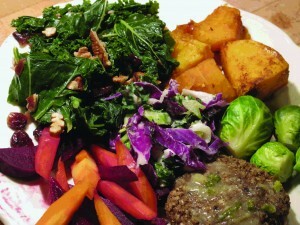 (Kasha Croquettes with Sweet Scallion Mustard Sauce, Kale with Cranberries and Pecans, Steamed Brussel Sprouts, Pressed Dulse Salad with LemonTahini Dressing, Orange Baked Butternut Squash, and Glazed Sauteed Carrots an Beets. 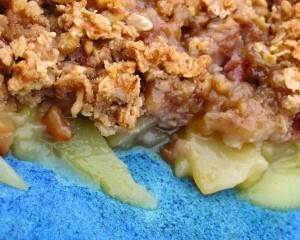 (below) Pear Crisp with Vanilla Sauce, the dessert from the December menu.